As a Christian it is very important that you know how to pick up a Bible and read it for yourself and how you can teach others to come to read the Bible. Never expect to learn the entire Bible in a couple of months.We have to get to know the Bible by learning it “one byte at a time.”. Try to get first the big story lines, and concentrate later on the particularities. This video will help you understand the absolute Basics to reading the Bible. First you got to know that the Bible exist of 66 books divided in the Old Testament (39) and the New Testament (27). You will learn how to find or look up any book of the Bible, how to find chapters and verses. Often we wonder about certain topics, so you would like to search on the topics. In my previous posting “Finding and Understanding Words and Meanings” I told you where you could find these topics and how you could use the bible Word Index and the Bible concordance. In the video you shall hear about the Cross reference. How to use cross-references, and several other helpful pieces of info. The narrator also speaks about which translation we should use. This would all depend on you in which language and in which style you want to read it, a modern, a classic or an easy to understand version. He mentions then some paraphrased bible, of which the Message is not so bad, but I would recommend to try to go for a literal translation in modern language, or in a not to difficult modern language translation for English, e.g. the New International Version or NIV. A very good translation is also the New World Translation, you always can ask to some Jehovah Witnesses to bring for you. If you have never read the Bible which book would you start with? I, and my congregation in Belgium do prefer to advise to start with the Book of Job. If you like poetry or when you would like to have some encouragement or would be looking for some help in your life, start with reading the Psalms. To find out more about Jesus (Jeshua) you could start with the gospel of John. Or if you would like to read first a short book, you can take the Gospel of Mark, which gives a good scope of the Master teacher Jesus from Nazareth, the son of God. To start off you do not have to read it from cover to cover. If you like wise quotes you could go to the Book of Proverbs. Do not try to cover to much in one time, because you would come discouraged. A good way do start your readings, is just to read one chapter a day before bedtime. After the first introduction and when you want to go and study the Bible than you have to start from the beginning, working your way up to the end, to get the whole picture. To do this it is not bad to either read every time some following chapters, or you could follow the Bible Reading Plan, provided for free by the Christadelphians. Think about what you have read and dare to ask yourself questions. You should not only read for information but also for inspiration. 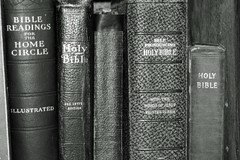 Is there any significance to the order of the Bible Books? 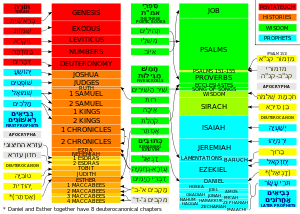 In a later posting I shall come back onto the summary of the contents of the many bible books and their connection with each other, and show that they are not placed chronologically. Dependant if you take a Jewish, Aramaic, Messianic Jew, catholic or a protestant Bible translation you may find different orders. In Catholic bibles you shall also often find apocryphal books. One of my preferred placings is: 1. Books of Law; 2. Books of History; 3. Books of Poetry (Psalms, proverbs and lamentations); 4. Books of Prophecy; 5. Book of Gospels; 6. Book of the History of the first Christians, the building up of the ‘church’, or the Acts of the Apostles; 7.Book of Letters or Epistles; 8. the most difficult book: the prophecy of the End-times or the Apocalyptic Revelation of Saint John. The commentary version is the one we always should be the most careful with and remembering that it are writings from human people, who not necessary where by God inspired. You may never forget that it does not make any part of the actual Bible, but are words from men and women like you and me. It depends on you. When it is your Bible you can do what you want. I would recommend that you underline with different colour markers, taking care of using the right marking pens that do not show up on the other end of the paper, and not make stains. Get to know the hidden power behind the many words. Many church-people no longer consider the Bible their standard for faith and practice, but it should be our General Standard and Most Important Guide in our life. Its ethical standards have launched freedom movements, and its laws and regulations have guided lawmakers, judges, and jurists by the score. It has inspired great works of music and art, including songs, sculpture, paintings, plays, and movies. Its graphic portrayals of heroes and heroines have captured the imagination of young and old alike. The Bible is Holy (Romans 7:12) and God-breathed (2 Timothy 3:16) and that those who hear and obey it are blessed (Luke 11:28). The Word of God is: True (John 17:17), Righteous (Psalm 119:172), Perfect (Psalm. 19:7), Living (Hebrews 4:12). It also is and shall be Enduring (1 Peter 1:23), Eternal (Psalm 119:89), Flawless (Psalm 12:6). It is for Sure (Psalm 19:9), Active (Hebrews 4:12) and is and shall be Healing (Psalm 107:20), Useful (2 Timothy 3:16), An encourager (Romans 15:4), A source of peace (Psalm 119:165), A source of wisdom (Psalm 119:98), A source of hope (Romans 15:4). Therefore I do hope you shall be able to see how Wonderful (Psalm 119:129) the Bible is, and shall be able to give you a new breath of life. The Bible is God’s Word given to every one, who wants to take it so that it can be The joy of their and your heart (Psalm 119:111), Trustworthy (Psalm19:7), Right (Psalm 33:4), Near (Romans 10:8), A counsellor (Psalm 119:24). Enjoy, and remember that Jesus loves you. The only printing company authorized to print the Bible in China announced Thursday that the nation has now printed over 100 million copies of the Christian scriptures. At the beginning of each month, I share my goals for the month ahead and track my progress on the previous month’s goals. Each turn of the page opens up to a large scene of a Bible story. The scene is detailed and bordered by Bible facts and hidden objects to find. If we were to say that God’s word can mean different things, then the word of God doesn’t mean anything at all. The problem here is that relativism was creeping into the Bible study. This entry was posted in Bible or Holy Scriptures, Bible Reading, Bible Study, Faith and tagged Acts of the Apostles, Bible, Bible Books, Bible Reading Plan, Bible Translation, Book of books, Book of Proverbs, Breath of life, Christian, Concordance, Cross-References, Ethics, Gospel of Mark, Holy Scriptures, Index, Jesus, Master teacher, New International Version (NIV), New Testament, New World Translation, Old Testament, Paraphrased Bible, the Message, Topics, Translation, Video. Bookmark the permalink.